The original plan shows the compound in the area marked Year 7. It has been built close to the rear of existing houses in Dunster Road. 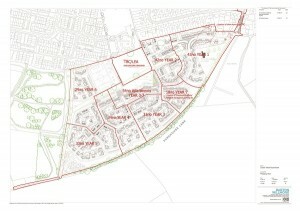 A meeting last week between residents living close to the K2 East development and senior officers from B&NES Council appears to have raised more questions than answers. People living in Park Road and Dunster Road in particular have been raising concerns over what they perceive to be regular breaches of conditions attached to the planning permission granted to Taylor Wimpey to build up to 285 homes on the controversial site. Photographs of lorries ignoring the agreed access and exit routes from the site have appeared in previous issues of The Week In along with others which have highlighted the constant nuisance of dust that households bordering the site have had to endure. Concerned at the apparent lack of enforcement action on behalf of the Council, a meeting was arranged between residents and the Council’s Head of Planning and Chief Enforcement Officer. The Officers explained that the body of evidence required for the Council to take action was significant and needed to be gathered over a period of time (images have appeared in The Week In since January). Even then, there was no guarantee of success if court action was started. Another of the residents’ complaints involving the position of the building site compound appears to have thrown up another mystery. People living in Dunster Road were becoming increasingly frustrated by B&NES apparent lack of action on this issue. The original phasing plan submitted with the planning application showed the storage compound located well away from existing houses on what would be the final phase of the K2 site to be developed. 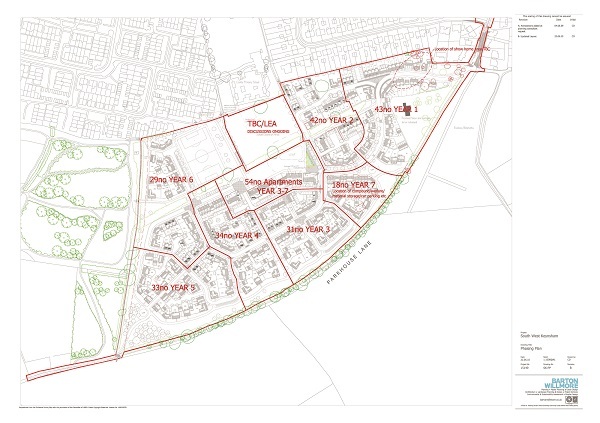 Both Taylor Wimpey’s Construction Management Plan and the Government Inspector in granting the subsequent planning appeal, made reference to this location and its distance from the existing houses. However, since work began in earnest, the compound has been situated on land adjacent to the rear gardens of houses in Dunster Road.